PALOS DE LA FRONTERA, SPAIN - (@The Comedy News) - Columbus Day is being celebrated all over the western hemisphere today. But a little-known story about the famed explorer, Christopher Columbus, is that he had the world's first public relations firm. New World Pillaging and Strategies LLC., founded in the fall of 1492 to manage all of the communications and public relations outreach for Columbus, continues to advise the explorer's top advocates on keeping the purported legacy alive. "Our public relations firm is the oldest in the history of the world, and employs some of the best public relations experts the world has ever known," stated Karl Koch, a public relations executive who's family has handled the Columbus account for almost 45 generations. 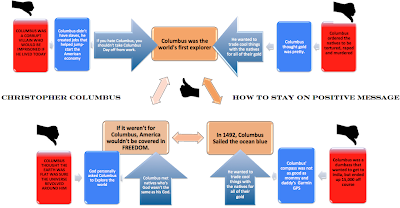 New World Pillaging and Strategies has relied on a flow chart for how to stay on a positive message when it comes to Christopher Columbus's accomplishments [CLICK IMAGE ABOVE]. The contents of the flow chart have been widely distributed, and are consistently used by Columbus' biggest advocates, many of whom lack the ability to think critically and have the propensity to just roll over when told to. According to the flow chart, many of the morbid, grizzly tales involving Columbus' expeditions---tales that New World Pillaging and Strategies have called "heretic lies and freedom-hating hell-dwelling", are refuted by the same core concepts: Columbus was the world's first explorer, if it weren't for Columbus, America wouldn't be covered in freedom, and the most famous of them all, in 1492 Columbus sailed the ocean blue. New World Pillaging and Strategies has been the leading public relations firm for a number of prominent farcical figures and events throughout history. Some of those include the denial of the Holocaust in the 1940s, The Tuskegee Experiments, and a partnership with the International Society for Waterboarding & Torture in Hopes of Getting War Secrets.